Yesterday, we spent most of the day in the (cellar) wool shop, starting at about 11:00 when FedEx dropped off a new box of wool from Washington for us. This was, of course, after moving the rest of my stuff out of the wool shop, distributing my books throughout the house, and opening the windows for the season. We washed the new fleeces twice (sheep are dirty) and then dyed them spruce, yellow and a chocolate. To wash wool, you have to let it soak a while in nearly boiling water to cut the lanolin oil. To dye wool, you have to cook it in big pots with water, dye and vinegar (think Easter Eggs) over a gas stove until it boils. Then it is spread over large drying racks. After the wool is dried after dying, it has to be “picked” or “carded.” The picker is a very dangerous machine that looks something like a medieval torture device with lots of Extremely Sharp Spikes. The wool is Carefully fed into the picker which, as the name suggests, picks it apart for spinning. Yarn spun after the picker has the nice curls and textures typical of Dad’s yarns. 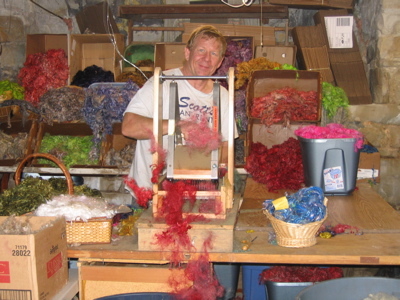 OR the dried, dyed wool can go into the carder. The carder divides up the fibers much finer than the picker. When you take the wool off the carder, it looks a lot like cotton candy, especially the Very Pink batch I did today. This makes for a more even textured yarn. While we were waiting for the wools to cook, Dad had me wash and “block” the latest batch of yarns he’d spun. They’re called Night Sky because of the many shades of dark blue, sprinkled with white silk and sparkly mylar that does a good imitation of the stars. Absolutely gorgeous. Skeins of freshly spun yarn have to be washed to set the fibers in the new twist. Then they have to be unwound and rewound to prevent tangles. (No, I didn’t get tangled.) This is called “blocking.” I haven’t quite figured out why yet. We took a break somewhere in there to bike downtown to Coffee Zone for a greek salad and hummus lunch. I also had a Cherry Italian Cream soda. Yum! This is Dad at the picker in the wool shop. You can see some of Night Sky in the basket on the table. This entry was posted in Yarn and tagged craft, Ozark Handspun. Bookmark the permalink.